Please do not assume lack of data is any sort of delaying tactic! I have a full time job as a software executive, and am also husband and father to a high school student, and run a small ranch. Serving as part time President of the road company as an unpaid service to the neighborhood fits into the tiny cracks that remain of my time. I sent to you what I had easily at hand. I guess I naturally assumed that your client would share with you the many and various communications we have sent to him. I was elected president of the road company in August of 2005, and I attach the annual letters we sent to all of the members, including your client in 2005, 2006 and 2007. This is typically sent with the bill for the membership dues. Sal or his staff received these and made the basic payments. Sal is a member of the brushroad yahoogroups mailing list, and gets all of these communications and updates. I also forward the direct letter we sent specifically to Sal on 2 September 2007, informing him of the facts as we knew them at the time, and seeking his direct involvement to help. It would have been wonderful if he had involved you at that time; but we are where we are, now nearly twelve months later. Since 2005, it has never been in question that the structure is on Sal's land. The question has been as to who built the structure. As you can see from the title report on Sal's land (attached), the agreement about (presumably) the road and the drainage structure is shown as item 5 "The terms and provisions contained in the document entitled Agreement, executed by and between Fred Lewis Foster, recorded February 11, 1941 in Book 1028, Page 80 of Official Records." I sent you this agreement such as it is in my previous email. I answer your other questions in line. In response to your telephone call to my home on the morning of August 11, 2008, I hereby confirm receipt of your email and the attachment which was forwarded to my email mailbox on Friday, August 8, 2008. I have downloaded the attachment and it contained three files which are 1) an easement deed, 2) a quiet title judgement, and 3) a series of letters and other communication relative to the drainage culvert near Brush Road and the Highway 17 intersection. I have reviewed what you sent, and it appears to me that most of that negotiation was continuing even after it was determined that the land in question is apparently owned by my client. My client indicates that his involvement has been pretty recent....which causes me to wonder why his involvement was delayed. We have been attempting to get Sal involved. See letter dated "2 September 2007" where we ask for his direct assistance. After sending him that letter I spoke with him on the phone and he said for us to do what we thought needed to be done, and let him know, that he is very busy with many other activities (as we all are), and can not be more involved. Likewise, there must have been a survey performed by one of the parties wherein the proper property corners were established as an update to the previously mistaken assumptions under which the State had historically acted. Do you have a copy of the survey or know where the survey documentation resides which supports this new "finding" by the State that it has historically acted as a "good neighbor" instead of as an obligor with respect to the culvert? When the State observed the failure, they went to the site with a GPS device, and determined that the failure was well outside of their jurisdiction. As you can see from the correspondence, we tried hard to establish that some part of it is on their land. Finally, we met personally with the Cal Trans Director of Rights of Way (who is also a certified surveyor) at the site in late April of this year, and he demonstrated where the corners of the property are. All that was in question at the time was whether there was any portion of the structure (say the last 5 feet of the pipe) which extends on to State lands. Unfortunately, there is not. We have asked for, and the state agrees in their assignment and release form (also attached) to place permanent property markers at the corners of their property, and road signs at the end of their road stating "Private Road, No Exit" to make this clear going forward. We have also had a survey done (attached) which delineates the lands of the streambed which we are offering to serve as the party responsible for the necessary occasional maintenance so that it does not plug and flood the road. Lastly, do you have any evidence, whether recorded or otherwise, and for argument sake assuming that the culvert is, in fact, on my clients property, that my client or my client's predecessors were ever aware of a drainage problem which resulted in the need for the installation of the culvert by the State in the first place? The evidence is incontrovertible that the culvert is on your client's land. The structure is north of the first hairpin curve of the road, and the entire hairpin curve of the road, and the land to the south of the hairpin curve road is owned by your client. The 2/11/1941 agreement (sent in the previous email) between Foster (then owner of your client's land) and Steinbeck (yes, this is the John Steinbeck) is the evidence that the road & culvert are on your client's property, and that the previous owner of your client's land was quite aware of, and permitted the construction and maintenance of the structure. History is otherwise quiet on the circumstances; we do not have as-builts, blueprints or name of contractor; and a reading of the Foster-Steinbeck Agreement document shows this agreement was an after the fact summation of rights and responsibilities, rather than a "let's plan and then build" agreement. Some historical context, and total conjecture: The State built Highway 17 starting in 1938, and as one could imagine this opening up of a quality access route through the mountains caused many people to quickly do what made sense to re-align access routes to take advantage of the high quality road. However, the nation was deep into the depression, so few people had any money. So quite likely Steinbeck paid to have the road & culvert built to give everyone access to the new highway. In 1939-40 Steinbeck has an affair with the movie star Gwen Conger, and in the spring of 1941 John separates from his first wife, Carol Steinbeck, and that fall he moves to New York with Gwen. Carol divorces in March of 1942. So viewed from this perspective, in February of 1941, Steinbeck (or his agent) is cleaning up the title in anticipation of possible divorce, and establishing rights over the access route that in previous years he just paid for the building of (Steinbeck bought the Biddle Ranch, on Brush Road, in August of 1938). The drainage "problem" was created by the constructing the new access road. The way they built the road was to construct dam across the streambed which, as you say, had existed for tens of thousands of years. When they built the road, they eliminated a drainage problem by at the same time building a drainage structure to capture the water which would have otherwise pooled up behind the road, and direct that water under the new road. That structure worked well from 1939 until 2005. 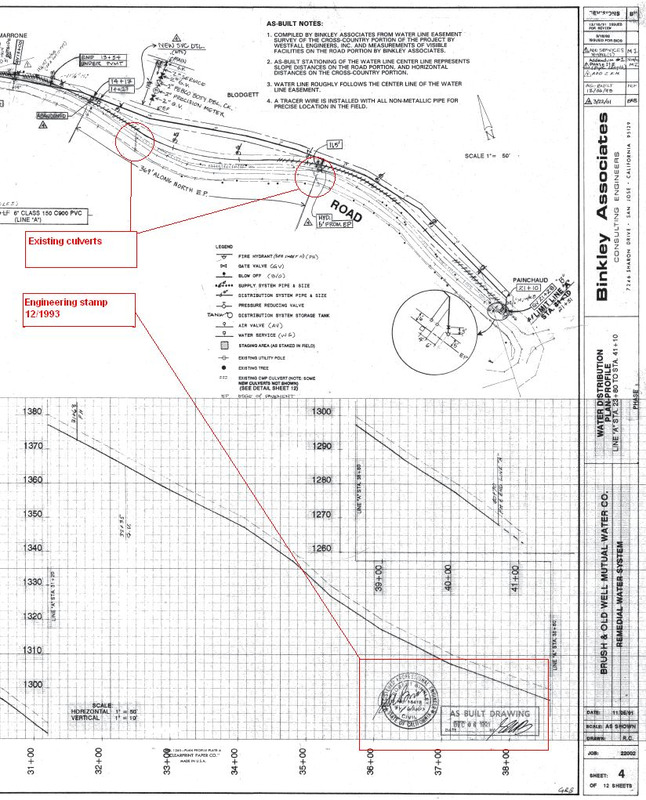 If you look at the Hw17AsBuilts (attached), you can see on what is the forth page of the PDF the right of ways they obtained, the proposed alignment of the new highway, and a proposed access road that would be built to give access to you client's property while construction was occurring, and as they eliminated the traditional access. Then you can see on the much busier sixth page of the PDF, that same drawing with the new Brush Road entry way drawn in. At the upper right hand corner the Ridge Road (which remains) and the old road which goes across the lands of Helen W. Hawkins (which was removed). The smooth dark curved line with the 1 2 3 4 on it is the center line of the new Highway 17. If you look at the area labeled William Logan, you see the area in question. This is the new Brush Road access, and the State bought from Logan the trapezoid shaped piece in 1942, which I believe you refer to as a land swap. Foster kept the portion that has the right hand curve, and then goes off of his land for the tightest hairpin left curve, and then the road comes back on to Foster's land (now owned by your client). I see some casual references to a "land swap" at some point in the historical past, but see no documentation that verifies such a "land swap" actually occurred. Do you have anything along those lines? I will scan in and send you a copy of the William Logan to State Deed which covers the transfer of the trapezoid. As you will see, most of the concern is over retaining the oil rights to the land under the road; and now with gasoline at $4 per gallon (versus the $0.12 gas cost back then), perhaps we should be focusing on that !!! Obviously, anything and everything you have will be helpful to me. It is my understanding from my client that the State has made a firm offer of settlement coupled with cash consideration which you have not included in your correspondence. I asked for everything you had, but it seems we have started our conversation with a filtered set of documentation.......I hope this isn't an indication of things to come, as selective communication usually just slows down the process. In summary, there appears to be a process here that has gone on for over three years that did not include my client for a major portion of the discussions. Instead your client was always informed by the BRC on status, and he was also asked personally to participate directly in writting twelve months ago, and he declined to assist. The Brush Road Corporation is a very interested party in the continued existence of the Brush Road as it traverses the streambed, as our members depend upon the road for access to their properties. We have a recorded 20 foot wide easement to that road. We are willing to stand aside and observe as Sal repairs the threat that his drainage structure, which he obtained when he purchased this land, poses to the continued existence of the road. We would then hope he proceeds quickly, as a normal to wet winter could destroy the road. If he does not repair the structure, despite three years of notice, and its failure prevents access to these 30 parcels, one could be certain that his fellow members of the Brush Road Corporation would take action. Conversely, we offer what we feel would be a much better solution, where he would join with these same neighbors, to effect a repair which would cost in aggregate about $100k, hence with $42k from the state, leaving the per parcel cost of just about $2,000. He would grant a drainage easement to the Road so that its agents would effect the occasional as needed timely cleanup and other maintenance of the streambed and replacement drainage structure so that future failures do not occur, or when and if such a failure does occur, our grantees don't need to spend three years in digging through papers to see who is responsible for such a repair. He has recently been asked (in rather strong language from my point of view) to provide easements and access to more than 20% of his parcel to solve a problem that he did not create without being given the essential information he will need to decide what his course of action should be. Sal's property (APN is 544-35-002, see attached land plat) is 14.94 acres in size. The drainage easement covers 2.05 acres, which is 13.7% of the parcel. This land has been streambed for tens of thousands of years, and will continue to be this for thousands of years after we are all gone; and with the current waterway laws there is nothing Sal would be allowed to do with this land. What we are asking for is a recorded easement so that if Brush Road hires contractors to clear brush or fix pipe, should these folks be injured or die, there would be no liability to your client. 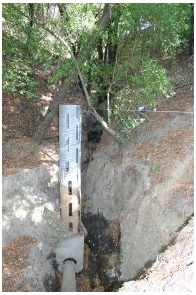 It appears to be presumed that the current configuration for the drainage culvert is the only viable method of controlling the water which has passed down that drainage area for hundreds of years and it suddenly has been assumed that my client is responsible, in some manner, for any and all damage that might result from losses to Brush Road, an ingress-egress easement that his predecessors in interest granted WITHOUT LIABILITY for any maintenance. You are correct, that this is the way the water flows. We hired a licensed hydrologist who researched the site and determined the flow of water over the land, the amount that might flow during the maximum flow over 100 years, and size the required pipes. His report was attached in my previous email, and we sent this to Sal in the September 2, 2007 letter. 2. Any facts, rights, interests or claims which are not shown by the public records but which could be ascertained by an inspection of the land or which may be asserted by persons in procession thereof. 3. Easements, liens or encumbrances, or claims thereof, which are not shown by the public records. 4. Discrepancies, conflicts in boundary lines, shortage in area, encroachments, or any other facts which a correct survey would disclose, and which are not shown by the public records. Even so, the above title exception does not apply - the Foster - Steinbeck agreement which describes the ingress-egress easement is listed in your client's title, and this 20 foot wide easement is actually listed twice; once in the first description, and then as Parcel Two. There is no easement or maintenance agreement recorded that covers the drainage structure. Perhaps there was an unrecorded agreement between Foster (or some later grantee) and the State Highway Association that covers the drainage structure. A diligent search of the Cal Trans (They took over the California Highway Authority) records did not reveal this; nor did the various title reports your client has obtained. So absent some recorded agreement showing someone else has responsibility for this structure, the responsibility falls to your client. Again, We the members of the board of the Brush Road Corporation are absolutely thrilled that Sal has engaged your involvement to advance the process here. We have tried many times to get Sal to work with us. (Please do note that most road members don't spend anytime on these matters either; they are content to let the few do the work of the many; so Sal is no different. However, in this case since the structure is on his property, one might expect that he would be more motivated to get to a good conclusion). I and my fellow Board members have spent many hours of unpaid time working on this matter, negotiating over the phone, via email, and meeting face to face with CalTrans people three times in their Oakland California offices, to try to get progress on this matter. We have worked with our State Senator, Able Maldonado, to successfully obtain his assistance in this matter multiple times, when CalTrans went radio silent. This process has gotten to a great point. We have gotten an amazing settlement from the State. Originally they were going to contribute $20k, we got them to up this contribution to $42k, and got this included in the allocation for the 2009 budget year; and as you can see from the Sacramento news stories, getting anything in this years budget is nearly impossible. As you well know, a law suit to get to a ruling on this matter would cost more than this, and we would not be able to prove culpability of the state, so we could not expect for those legal fees to be reimbursed if we prevailed. The total one time charge to Sal is around $2k to make this matter go away, and eliminate any liability to him for future issues with the road, or the water related to his land. I personally hate it when someone tells me, "Don't worry, trust me, just sign." And here I am appearing to ask your client to do this very thing. This is not the case. We have shared with him all of the details. We asked for his direct involvement one year ago. He declined. He did not contribute to the funding for the project. We have gotten a good agreement without his help. Now I am sharing these details with you, who is the guy brought in at the end, and the guy being asked to make a quick decision, while still absorbing the facts. Please take the time you need (but only this amount!) Please let me know anything else you need, and I will be happy to provide it if I have it. Your client and we do have a pressing need to get this fixed before the threat turns into a washed out road. We have a contractor who is ready to go; we have been asking for him to slip out start date as Sal asks for additional data and meetings. The next current start date is August 15th. The total job will take about one week to complete. By California law, construction in the mountains must be completed by October 15th, so as to avoid the inevitable storms. Your complete cooperation in this regard will be appreciated. Indeed, and yours as well! P.S. My home telephone number is probably not the best one to use for me. For now, telephone discussions are probably not productive. I find that a complete review of all pertinent documentation always puts things in a better perspective for fruitful conversation at a later date.